Last year was full of challenges for Iran. There were countless pressures and challenges for the regime at the domestic, regional and international levels. At the beginning of the year, there were mass protests in cities and towns across the country, with demonstrators chanting slogans such as, “No to soaring prices.” These quickly escalated, with protesters demanding the fall of the regime and the end of its Wilayat Al-Faqih ideology. Although the regime managed to crush the protests, it continued to suffer from ensuing factional protests due to its failure to tackle the root causes of the crises in the country. The most important factional protests were by truckers, sugar refinery employees and other workers in Ahvaz, as well as by students, teachers and traders. These protests continued in tandem with other protests led by civil rights groups and political dissidents disillusioned with the prescriptive restrictions imposed on the public sphere by the regime. Domestic instability further worsened as violence mounted in the areas populated by the country’s long-oppressed minorities, particularly in the Kurdish and Ahwazi Arab regions in the northwest and southwest of the country, as well as in the Baloch regions in the southeast. Separatist groups targeted personnel from the army and the Islamic Revolutionary Guard Corps (IRGC), inflicting heavy losses. Amid the severe and multi-dimensional internal crises facing the regime, strong criticism emerged from within, warning the rulers of the grave dangers if they continued to pursue the same policies. The most prominent faction criticizing the regime’s policies was under the leadership of Hassan Khomeini, the grandson of the founder of the Islamic Republic, Ayatollah Ruhollah Khomeini. Another faction criticizing the regime’s policies exploited the crises to ensure political gains. This faction, led by the reformist figure Faiza Rafsanjani, warned of the regime’s imminent collapse. 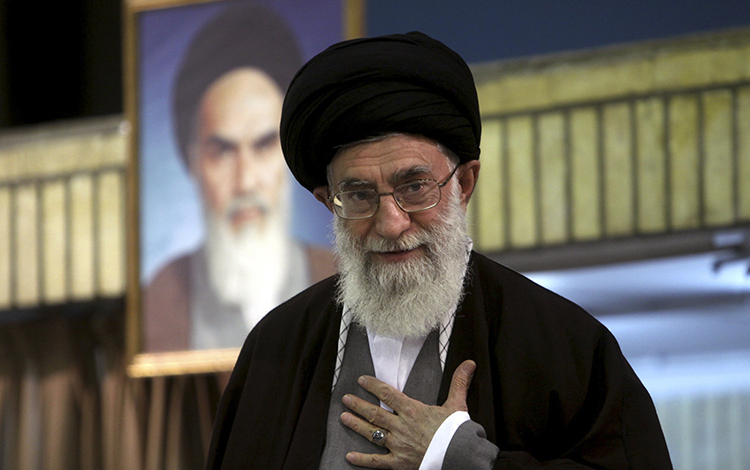 Its future was cast into even greater uncertainty at the end of the year, when Mahmoud Hashemi Shahroudi, the principal candidate expected to succeed Supreme Leader Ali Khamenei, died. Regionally, Iran’s relations with its neighbors deteriorated and tensions increased, with the Tehran regime being subject to tremendous pressure in multiple arenas. The coalition led by Saudi Arabia in Yemen, supporting the legitimate government there, managed to achieve a number of victories, leading to Iran’s presence being reduced in critical areas such as the Bab Al-Mandab Strait. Also, efforts in the Iraqi arena helped in curtailing Iran’s influence. Iranian diplomacy was hit with a number of severe blows, with some countries such as Morocco announcing their intention to cut diplomatic ties with Tehran. Iran’s relations with Algeria, Mauritania and some other African countries also turned sour, with many either severing or downgrading their diplomatic ties with Tehran. At the global level, the US withdrew from and undermined the 2015 nuclear deal. At the end of the year, the US reinstated previous sanctions revoked under the deal, as well as adding new sanctions. The IRGC's role has become ever more important to the regime given the woes it faces at home and abroad. As a result of Donald Trump’s policy on Iran, foreign companies withdrew and most countries, fearing US retaliation, suspended their economic cooperation with Tehran. Despite the EU’s supportive position on maintaining the nuclear deal, its relations with Iran remained tense. The UK, Germany and France considered new sanctions on Iran due to its ballistic missile program, while Iranian diplomats faced accusations surrounding their alleged support of a bomb plot targeting a dissident conference in Paris in June. This quickly led to charges of espionage and of diplomatic norms being violated by Iranian officials. Albania expelled the Iranian ambassador and other Iranian diplomats. In 2019, the regime will likely face tougher pressure, especially since it has approved a 50 percent cut in its 2019-2020 budget. The budget reveals a number of service sectors facing severe cuts, while allocations are likely to increase for parallel institutions compared to last year. In addition, there has been an unprecedented surge in the price of certain goods, up by 60 percent, while inflation has soared to 39 percent. According to official statements, the number of citizens now living under the poverty line has risen by 50 percent. Besides, unemployment among university graduates has also sharply increased. This will undoubtedly fuel further anger on the streets, placing more pressure on the regime. In the midst of these crises, the IRGC has exerted more influence on the regime, given President Hassan Rouhani’s political failures and plummeting popularity. Also, its role has become ever more important to the regime given the woes it faces at home and abroad. Subsequently, the regime is likely to entrust the IRGC to control the domestic situation, as well as to outline strategies to evade the US sanctions, particularly those on its banking and oil sectors. Upon Khamenei’s death, the IRGC may swiftly seize power through a bloodless coup, resulting in a malleable religious figure being placed in power and the IRGC ruling the country from behind the scenes. Also, the Iranian regime is likely to face pressure from Saudi Arabia and its allies as they establish a comprehensive network for regional security that covers the primary and most vital Arab spheres. This external pressure, along with internal pressure, could push the regime to offer concessions at the regional level for it to overcome its ongoing domestic dilemmas. On the international scene, it could be said that 2019 will represent a real test for the Trump administration’s “extreme pressure” strategy. Despite the apparent gains for Iran’s regime from the US withdrawal from Syria and even Afghanistan, Trump’s bet on forcing Iran to change its regional behavior is mainly related to his political career. Iran’s defiant strategic posture will be decisive in determining Trump’s future. His decision to withdraw US troops is flexible, and he has not ruled out military intervention should the need arise. US troops in Iraq and the region are significant, whilst the number of US troops near the Iranian border has increased noticeably.